If you currently have an ADFS infrastructure built the next step is to configure the relationship between Office 365 and your ADFS infrastructure. This is done with the following PowerShell commands. PowerShell Remoting should be enabled and allowed on both the ADFS and WAP servers. This then points to the ADFS server context, this should be the FQDN of the ADFS server if you are using a single server setup. If not it should be set to the server farm name, in which the appropriate DNS records should be configured. 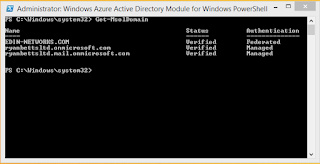 This command actually converts the Office 365 tenancy to use the ADFS for authentication. You can test that the settings have been applied correctly using this command. 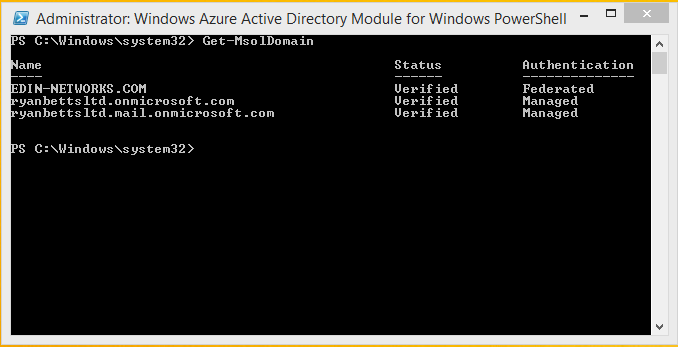 You can also see that there is a Microsoft Office 365 Identity Platform under the Relying Party Trusts under your ADFS servers.